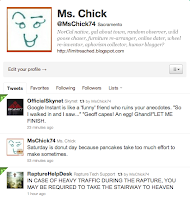 >Twitter – What is it good for? 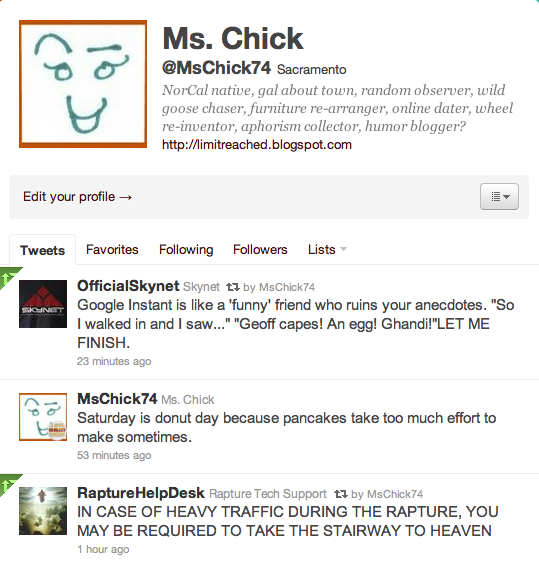 Amy Ruiz Fritz May 21, 2011 May 21, 2011 No Comments on >Twitter – What is it good for? Why are you on Twitter? Three and a half years ago, the original reason was curiosity. What was this microblogging thing all about? Do people really care about my every move? No. It has become an interesting phenomenon. Twitter has been the place I’ve learned about breaking news (Japan earthquake, Osama bin Laden’s death, Randy Macho Man Savage’s death) while going about my daily routine. But it’s also a creative writing endeavor, at least it is for me. It has become an extension of my blog. The short, weird observations or obsessive thoughts that might not call for an entire post, but are still funny or interesting, sometimes anyway, now have an outlet. Some people have taken this creative writing aspect so far as to conjure up fictional personas. Some of them are related to current events like the BronxZooCobra or the RaptureHelpDesk while others are fan based like the myriad of Star Wars handles. Ok, maybe that one crackpot’s doomsday prediction isn’t an actual “current event”, but it certainly was entertaining to poke fun at the situation. I liken Twitter to a party where most people are just talking to themselves, but sometimes others comment on what you have to say. You find other people to follow because someone you currently follow retweeted or mentioned them and your interest was piqued. Some people use it to sell their wares, but again they really are just talking to themselves in the hopes that someone was listening at the moment. Either way, I am entertained by it more often than I am by television these days. It’s sad, but true.